The great thing about having a small, quiet family Thanksgiving with no other guests is that everything is very relaxed. While other kitchens may have been buzzing with frantic cooks fighting for oven time at 6 a.m. on Turkey Day, our kitchen kept a calm, steady beat all day long. There was no set dinner time. Since no one had to leave by a certain time and there were no guests sitting around, twiddling their thumbs impatiently, no one felt obligated to eat at a certain time. Dinner would be ready once all the food was ready, whenever that may be. Turkey and vegetable prep didn't even start until about 2:30, after we had lunch. Lunch? On Thanksgiving? That's right. There are some fools out there who still believe that if they starve themselves all day, they'll be able to pig out even more at dinnertime. Wrong-o. Serious eaters know that it's important to eat something light before a big feast in order to get the stomach ready -- stretch it out, so to speak, to make more room for the big, bad bird and all its side-dish sidekicks. 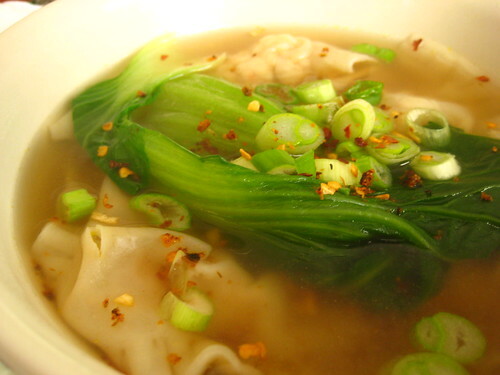 So for Thanksgiving lunch, we had won ton soup. 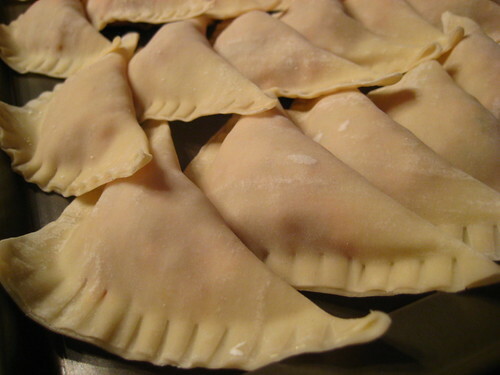 I helped my mom make the won tons the night before. 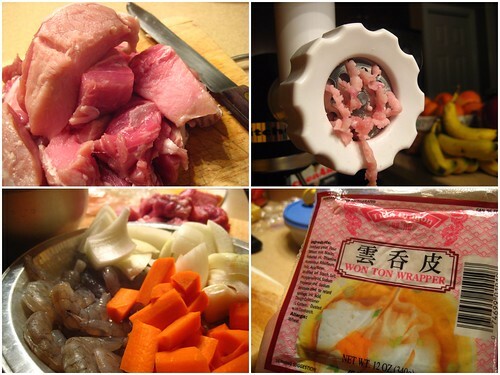 She ground up some pork, shrimp, carrots, and onions, then mixed it together for the filling. 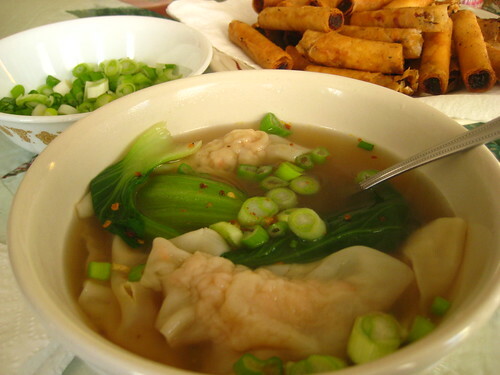 Won tons are much easier to wrap than lumpia. For one thing, the wrappers are smaller and thicker and easier to separate. 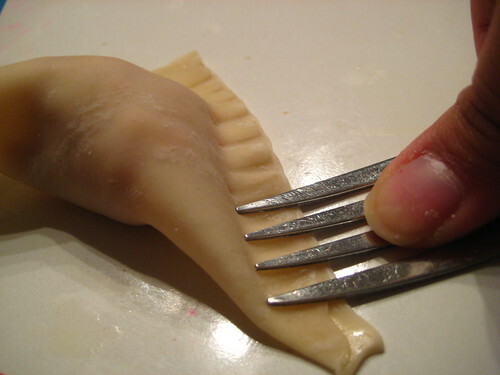 Second, the process is simpler and quicker -- just spoon the filling in the center of the wrapper, rub the edges with egg, fold the corners together, and pinch with a fork. The soup was light and delicious -- a perfect non-Thanksgiving lunch before a very Thanksgiving dinner. Served with baby bok choy, green onions, and roasted garlic flakes. Did you notice the eggrolls in the background? There was leftover filling, so Mom made lumpia Shanghai -- to be featured in a later post. 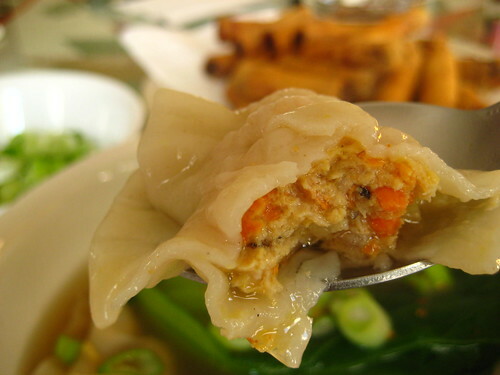 But for now...won ton innards! SO impressive. You guys are amazing. BTW: Love your new profile picture. Your face looks so happy as you're looking at the plate. Love it. A Christmas day in PARIS!!?? Jealous. So jealous. Wow, I'm impressed that you ground your own meat for this. It looks great! thanks, gaga! my mom grinds her own meat for EVERYTHING!